* Luberon kicks off as a lavender bomb. * Lavender stays the focus, as a light rose makes an appearance. * The woodsy base has a bit of a forest smell, yet is soft and a little bit sheer. Summary: Luberon is one of the times when the story really matches the fragrances. Maria Candida made this scent to capture the summer days of the Luberon area of Provence, France, and the lavender fields. This is a strong lavender fragrance that projects massively when first applied. It smells really expensive – as in the ingredients seem to all be the real natural thing and not a synthetic approximation. When talking about this in a forum, someone mentioned they didn’t like the way the mint came off, calling it toothpaste-y, but it didn’t do that on me. I would definitely recommend skin testing this one. Longevity is excellent, at over 12 hours on my skin. 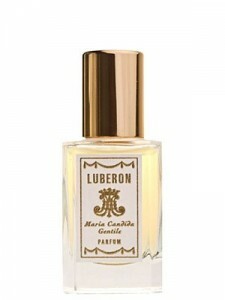 While this is not my favorite lavender fragrance (Caron Impact is), Luberon is definitely a great scent and a powerful masculine statement fragrance. Disclaimer: Sample provided by publicist for review. Image courtesy of Indie Scents website. If this comes a close second to Caron’s Impact, then it is surely worth a little of The Dandy’s time to at least try. Caron Impact is definitely worth a try.. as is Luberon.